I was first introduced to Mutton Bird Oil capsules by a friend who somehow managed to miss a severe case of gastro my family and everyone we know had, except her. Her children and immediate family were ill but not her! She put it down to the capsules, and to help with her aching knees. After taking the capsules I found my nails to be super strong and healthy, my hips and ankles stopped aching, from exercising on treadmill (I'm 29). I work as a family day care educator and work with a lot of sickness throughout the winter. I also have children at school so we catch everything! I have found the capsules have helped my overall health and severity of colds and flu's. Since raving about the capsules my husband takes them, both my parents and my inlaws. From helping with aches in legs, knees, hips, shoulders, cholesterol and general health. Love my Mutton Bird Oil capsules and highly recommend them to anyone!! A new staff member at our shop suggested that we stock Mutton Bird Oil capsules as they would fit well with similar merchandise. Subsequently, all our three staff members began taking Mutton Bird Oil capsules and remarking on the benefits. Our business is quite high-powered and involves lots of travel: I frequently have visitors staying; I have a large garden, house, family and grand children to attend. I am 68 years old. Before Easter 2011 (lots of visitors and a very busy time in our shop), I was feeling overwhelmed and thought "I just want to drop out of life; I can't cope; Take me to the nursing home!" I took a Mutton Bird Oil capsule and next morning jumped out of bed, looking forward to the day and filled with "joie de vivre". This feeling of wellbeing and the joy of life has continued and for me has been the most noticeable and dramatic effect of taking Mutton Bird Oil capsules. I began with two per day, but have reduced to one per day and am finding that sufficient. My husband, daughters, sons-in-law and friends have noticed my energy and vitality and have began taking Mutton Bird Oil capsules themselves. All have been astounded at the results, not only the renewed vitality, wellbeing, but improved skin texture and improved arthritis pain; their remarks about the benefits of Mutton Bird Oil capsules are never-ending! Like the ripples in a pond, Mutton Bird Oil capsules are improving the lives of an ever-widening circle of people in my orbit. Just a note to let you know that my husband and I come from Brisbane and have Mutton Bird Oil Capsules sent to us, from Tasmania where they are packed. My husband has always had a problem with his cholesterol and he thought he would try these, his levels were up to 7.2 six months ago and is down to 5.2 and his doctor is very pleased with him. So thank you to the people who had the sense to bottle mutton bird oil capsules. For some years i have been taking prescription and non prescription pain killers for very painful wrist joints with no relief and sleepless nights, also taking 6-8 fish oil capsules a day. After an unrelated discussion one night how we used to give mutton bird oil to our racehorses for inflamed joints, and also to our show dogs for health reasons years ago, I thought it may a good idea to try it for my wrists. After a search we found your Furneaux Oils Mutton Bird Oil capsules and I commenced taking two a day on 28/9 for fourteen days. After this period I noticed a reduction of the pain and swelling in my wrists so reduced the capsules to one a day up to this day 6/12 I have had no pain . Liz, I am extremely happy with the results and hope being pain-free will continue. John has a bad back through wear and tear and damage but thinks he has noticed a difference in the severity of pain. I have been taking mutton bird oil capsules for about 3 years now and have found that my general health has improved. In addition to a noted reduction in catching flu and colds, I do not feel the cold as much which may be due in part to improved blood circulation. The capsules are an easy daily medication, do not affect taste and do not cause adverse breath odour or indigestion. 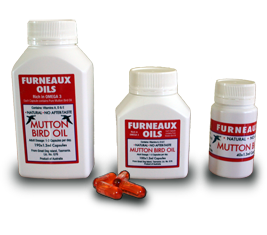 We have been taking Furneaux Mutton Bird Oil capsules for at least two years and found that we have not had the flue or a cold to speak of in that time. We also feel that it is beneficial to our joints as we both have arthritis.